Paint, Beer, Water, Sand and more are used during this show: That being said, this entire theater is a sp;ash zone! Make sure you wear clothing you don’t mind getting ruined in! This show is a 21 and up show, however check their website. Sometimes they have a kid friendly performance! Bring an open mind! If you are a clean freak and hate getting messy then this show may not be for you! However if you are looking for a great time then this is the show for you! Now on to the good part! First off this show is located on the back side of Senior Frogs, so you can use their valet parking! When you arrive, you are either given a shirt or you can purchase a shirt (depending on what package you choose) to customize and paint as you see fit! We had a blast painting each other up! Once your painted up and had a drink or two at the bar the show begins. Girls dance on the bar, throw pitchers of colored beer, and interact with the audience. You then move into the huge warehouse space where the main show takes place! Sand, water, paint and more are thrown and used in expressive dances all over the space. There is no dialogue during the performances so you can intemperate the dances as you see fit, however a theme was obvious. Love was the showcase of the night. Finding love, loosing love, intimacy and more were shown with the help of music, dance, and more! Honestly, I do not want to tell you any more about this experience because the unknown is part of the fun of this show. I took a group of 5 with me and we had a great time. 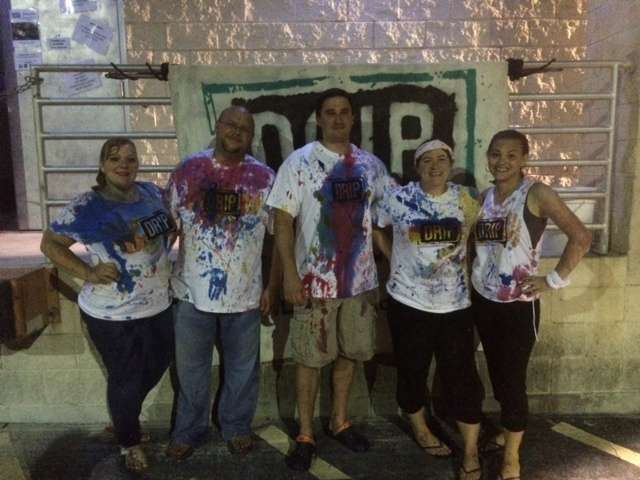 By the end of the night we were covered from head to toe in paint, water and beer. If you are looking for an escape from life and need a night to have fun and go wild then this is the show for you! We highly recommend you joining in the fun and going with the flow when your at Drip! The more energy you show, the better the performance and the better time you have! To purchase tickets go to www.IloveDrip.com! Performances are normally Friday and Saturday Nights only, but check their calendar to see if there will be an extra performance when your here in Orlando! Watch the video below to hear more about the show in an interview with one of the dancers at Drip!